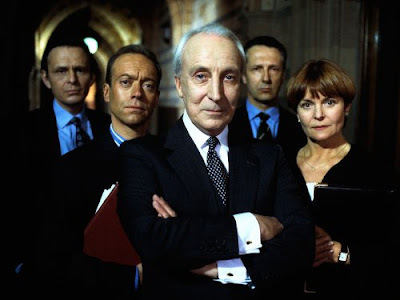 House of Cards (1990), (♦♦♦♦): Francis Urquhart (Ian Richardson) is the Chief Whip of Britain’s Conservative Party. He is a disciplinarian; he keeps the troops in check. Mr. Urquhart is also apparently a man without further political ambitions. But what better test for a politician's ambition than a general election in which a charismatic man, "with no background and no bottom" has been elected? Henry Collingridge (David Lyon), a relatively young man whose only political desire is to be well liked, is elected for the Conservative Party as the Prime Minister, with less majority than predicted by the polls. He is the pebble in Urquhart's shoe, the first of many, for the Chief Whip will use political mischief, and every dirty secret in his files to clear his path to higher office, including manipulating Mattie Storin (Susannah Harker), a young journalist with dreams of becoming a heavyweight political analyst. 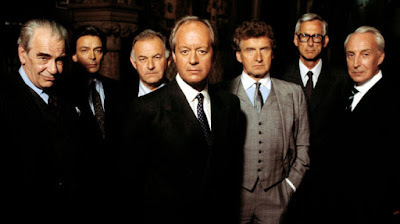 I had watched at least the first 15 minutes of the original House of Cards, a BBC and WGBH Boston adaptation of Michael Dobbs' trilogy on power, at least five times over the past few months with no real desire to commit to this series. I have to say also that I thought I wouldn't understand the politics, but surprisingly enough, politics and politicians are alike no matter what country you inhabit. Dirty tricks and political mischief are as old as time; I have had the opportunity to get a glimpse of that by reading Suetonius' The Twelve Caesars. Some Caesars like Tiberius, Caligula, and Nero resorted to poison to checkmate their foes. Modern politicians, however, employ less conspicuous means, such as coercion, suicide by two bullets, or manipulating public opinion by using the media to make or un-make a candidate. In the end, it is ultimately the people who must question who benefits the most from a political disaster. I had a great time watching House of Cards. 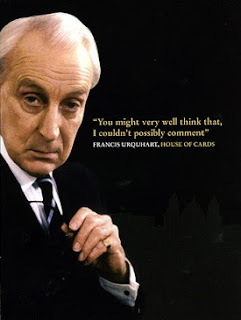 Francis Urquhart frequently addressed the audience directly with the intention of making it complicit of his malice. I found Francis Urquhart so entertaining in his Machiavellian ways...He always got rid of an opponent with a devilish smirk on his face, or raised one eyebrow to punctuate his disapproval. 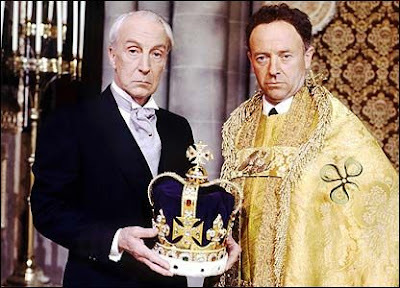 Ian Richardson was brilliant as Urquhart. He was the protagonist, but left no doubt that it was his time to shine and did so marvelously. Impressive also was Susannah Harker (Jane Bennett of 1995's Pride and Prejudice fame), who ably kept up with Richardson and gave him a run for his money as Mattie Storin, a young woman infatuated with power. The rest of the supporting cast was outstanding as well. There are a few things in House of Cards that look dated, such as the talk of Collingridge about "European countries recently freed from the grip of Communism", the incessant use of landline cord telephones, and the computers that look as old as dirt. Despite these elements, the series could have been filmed today without losing its luster or its appeal. To Play the King (1993), (♦♦♦♦): Francis Urquhart (a.k.a. FU) (Ian Richardson) has been PM for some time. A new monarch (a.k.a. HM) (Michael Kitchen) has acceded to the throne. Both must inevitably meet to discuss politics and matters of state, but FU is in for a big surprise, because His Majesty wants to spearhead social change and empower the marginalized sectors of society. In To Play the King there is a lot of British politics; luckily though, the ruling party is conservative, and I more or less know what comes with that. It was interesting to see the role of a monarch, who is a figurehead, being played out as an idealist, in contravention with the politics of the party in power, because a monarch may have political opinions but cannot afford, for the sake of constitutional unity, to air them in public. The power struggle was nicely explored, as well as the differing views of both leaders. This time around, FU is being haunted by what he did to Mattie Storin. He shows something resembling a conscience. Once again, he uses a power-struck young woman to achieve his goals and have a bit of personal fun on the side. Again, it doesn't end well. The Final Cut (1995), (♦♦♦♦): Francis Urquhart (Ian Richardson) has been Britain's PM for ten years. He may beat Margaret Thatcher's record as longest serving PM, but new threats to his power arise from within his cabinet. Tom Makepeace (Paul Freeman) is the Foreign Affairs Secretary, a man who is considered emotionally a child by those who know him well, but who has a veneer of respectability that may be just what the country needs. When FU thinks he is losing ground, he invents an incident between Cypriots and Greeks in which he has to intervene with the right balance of leadership and strength. That could work out for him as the Falklands War did for Thatcher. Meanwhile, a Greek-Cypriot family is looking for two of their relatives who were killed during the Cyprus-British war in the 1950s, and they suspect FU doesn't want to release the documents that may clarify what happened because he was the young British officer who caused their deaths. In The Final Cut, we meet a FU who is haunted by Mattie and what he did to those two men in Cyprus a lifetime ago. He zones out even during Parliament sessions. He could retire while still popular and avoid scandal now that he has acquired a handsome nest egg, but it is not in him to give up the fight. With a younger man, whom Urquhart doesn’t consider a worthy rival, aspiring to higher office, he will fight dirty and may even use his personal secretary, Claire Carlsen (Isla Blair), as his weapon of choice because she used to be the man’s mistress. I was ready for this trilogy to end on a certain note, but I have to say the ending really took me by surprise; I wasn’t expecting it at all, but in retrospect, it seems fitting. It could not have happened any other way. 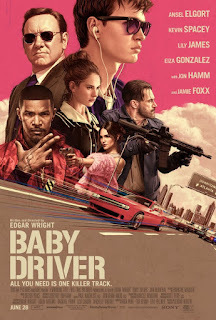 Baby Driver (♦♦♦♦): Baby (Ansel Elgort) is a young and gifted getaway driver. He can outmaneuver his chasers while listening to his playlists with his headphones on, which is why, among the people who work for Doc (Kevin Spacey), he is the only constant every time a "job" comes up. Baby doesn't know that erasing his debt with Doc doesn't mean that he is free of his boss, and he is going to find out really soon how high the stakes may get in his latest assignment. Baby Driver has a relentless pace, with high speed car chases choreographed to the beat of cool music, dynamic camera work, heists that are rough around the edges (or just plain rough), and good working chemistry by the whole ensemble cast...Overall, this film is great escapism, and a solid entry in the heist genre. Churchill (♦♦♦): Explores the days prior to the Allied invasion of Normandy on June 6, 1944 (D-Day) in the life of Winston Churchill, the worries over how best to serve his country, and the fear of massive casualties brought on by an offensive that seemed much too familiar to one almost 30 years prior during the great war. 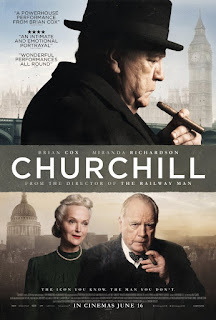 Despite my average rating, Churchill is a must-see artistic movie, one of the few thus far this year. The ensemble cast, led by Brian Cox as Winston Churchill, Miranda Richardson as Clementine (Churchill's wife), the dashing James Purefoy as King George VI, and John Slattery as General Eisenhower, all give superb performances. I was quite taken with the overlaid ghost images of Churchill walking on the beach, and worrying over massive casualties, while pronouncing his speech to reassure his British subjects that whatever casualties they incurred on D-Day would not be in vain when Europe got rid of the cancer that were Nazism and Hitler. 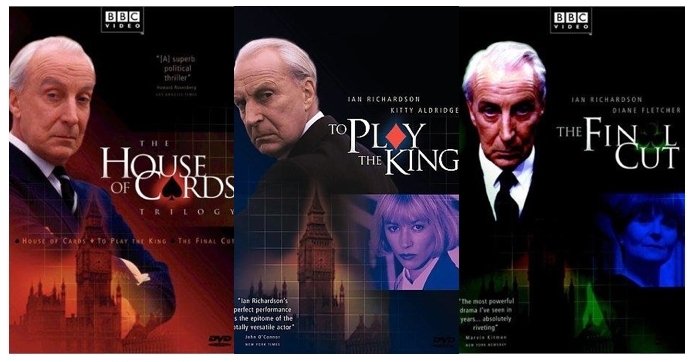 Ian Richardson looks like the perfect bad guy/politician in the original House of Cards; the trilogy looks good. I'd like to see the Churchill movie or perhaps I have? I will have to check; Brian Cox looks familiar as Churchill. I guess the new Churchill movie is coming out at Thanksgiving called Darkest Hour. hmm. This Churchill movie is from this year as well. I will be watching the Darkest Hour; that one is with Gary Oldman in the leading role. Every so often, either my husband or I will suggest watching the original House of Cards but so far we haven't succumbed to it. I think we are so burnt out with the American version (and with politics in general) that we haven't been able to face it, but we'll get to it some day. Churchill looks interesting. I'd watch just about anything with James Purefoy and John Slattery. You are so right about dirty tricks and political mischief. I used to be outraged but the more I read and learn the more I seem to accept it as part of life. I am not sure I should. I just finished the second volume of the Lyndon B Johnson biography by Robert Caro so have been immersed in that sort of behavior. Interesting that you could follow a British version of politics because it was, well, politics and as you say conservative. Thanks again for the movie reviews. You always help keep my queue filled up. Perhaps not the best rating ever but I do fancy Churchill. It may be more fiction than fact, but Brian Cox gives one heck of a performance. Baby Driver looks interesting, though after this week, I'm not sure I'll ever be able to watch another movie w/ Kevin Spacey in it again.